Splash into fun no matter what the weather! There are many indoor water parks in Ohio that offer guests summer fun even in the depths of winter. Regardless of the weather outside, the forecast at these parks always includes balmy temperatures, warm water, and lots of fun for everyone. There are many different indoor water parks located throughout Ohio. The state has a reputation as a well known destination for theme park enthusiasts, and now there are many options available for water park fans as well. Castaway Bay: Part of the Cedar Point resort family and near Cedar Point amusement park, this tropically-themed indoor water park offers a wide range of fun features. Palm trees and lagoons surround the 100,000 gallon wave pool, the thrilling water coaster, two 50-person whirlpool spas, multiple water slides, a pint-sized toddler pool, and other great attractions. Other resort facilities include a day spa, modern fitness center, arcade, restaurants, and more. CoCo Key Water Resort: This indoor park has two locations in Ohio - one east of Columbus in Newark, and the other in Cincinnati. Both parks offer more than 50,000 square feet of aquatic fun including body and raft slides, water basketball, activity pools, and the innovative Dip-In Theater. Private cabanas can be reserved for even more luxury and relaxation, all surrounded by a Key West inspired theme. Great Wolf Lodge: This well known indoor water park also offers two Ohio locations, one in Sandusky (near Cedar Point) and the other, slightly larger park in Mason near Cincinnati. Both parks are themed in a natural, woodsy style and include an intricately decorated performing clock tower in the hotel lobby. Water park features include multiple slides, pools, a four-story tree house water fort, family flume slides, a lazy river, and family and adults-only whirlpools. The larger park near Cincinnati is also home to a wave pool. Kalahari Resort: This African-themed indoor water park is located in Sandusky and proclaims itself America's largest indoor water park with a facility featuring 173,000 square feet of aquatastic fun. The park includes a FlowRider surfing simulator, wave pool, the Swahili Swirl innovative bowl slide, four lanes of racing mat slides, a swim up bar, lazy river, activity pools, children's areas, and plenty of fountains, waterfalls, and geysers. Outdoor activity areas also include private bungalows, sand volleyball courts, and more. 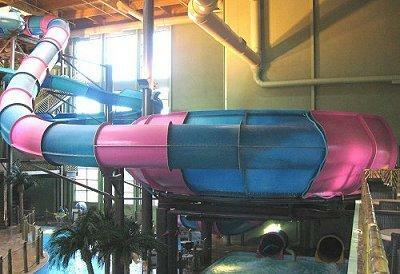 Fort Rapids: This wild west indoor water park is located in Columbus. Though smaller than the mega indoor water park resorts, it still offers a wide range of fun activities including the Cowboy Creek lazy river, multiple water slides, a kiddie area, and a 30-person hot tub. Dry activities enhance the wild west theme and include old time photos, panning for gems and fossils, and airbrush tattoos. Splash Bay: This small park is part of the Holiday Inn in Maumee, near Toledo. A lazy river, whirlpool spa, interactive tree house, and multiple slides offer fun for the whole family. Splash Harbor: This park is part of the Comfort Inn in Bellville, Ohio. A geyser area, water basketball court, family and adults-only hot tubs, large waterslide, and kiddie pools offer something for everyone. There are many indoor water parks in Ohio that eager travelers and local residents alike can take advantage of for a fun day in the water without worrying about the weather. From mega resorts to smaller, family-oriented parks, there are always more wet attractions under development to offer crazy splashes and unlimited smiles.